Sukiyaki is comfort food. I know you are thinking. I have been cooking a lot of comfort food lately and thereby overused the word 'comfort' on my blog. But what else is one to do when the weather is so unpredictable these days. Warm sunshine one minute and miserable, cold overcast the next. When the weather doesn't even know whether it's coming or going, isn't this sort of food the exact remedy that we are all seeking to sooth ourself with? Heart-warming, simmering stew is just perfect for a cold evening. One of the most popular dishes in Japanese household that is designed to be cook on a table top right in front of the diners. 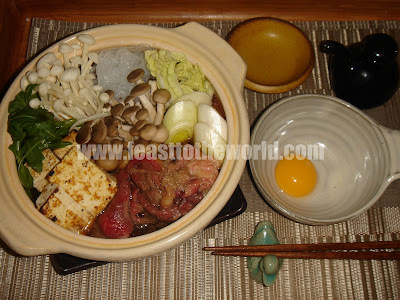 There are two different method of preparing this dish in Japan. 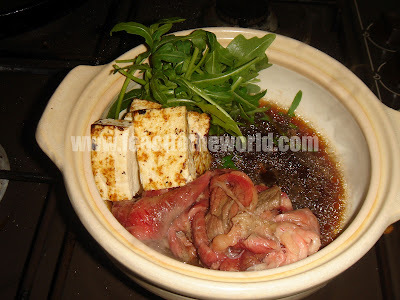 The eastern or Kanto method is to first prepare a sweet sauce (warashita) using soy sauce, mirin, sake and sugar, which will then be added to the meat and vegetables to simmer. The other method, western or Kansai style, is to pan fry the beef and vegetable and then season with the sugar and soy sauce, adding the mirin and sake toward the end. This is an incredibly easy dish to cook, despite the seemingly long list of ingredients. The more unusual ingredients can be found in all good Japanese supermarkets or online through Japan Centre. However, do not let it stop you if you can't find the exact ingredient. Other then the beef, which need to be of good quality, well-marbled and thinly sliced, the rest can be substitute with any of you favourite vegetable. Broccoli, chestnut or portobello mushrooms, savoy cabbage, carrots etc are all delicious in this sweet and salty savoury sauce. Make sure that they are either sliced or cut into small, manageable pieces so that they not only look elegant, but also cook quickly. This dish is normally prepared using a sukiyaki pan, which is made out of black cast iron but I'm using a claypot (nabe) here which works just as well, as because I don't have a portable gas stove, the clay pot is excellent due to it's ability to retain heat well. This can also be cook in a large pan and if you wish, transfer the content into a large bowl once cooked to serve. Traditionally, the dish is serve alongside with a lightly beaten egg for each diner. Each diner dip the hot slices of beef, which will then cook the egg slightly as it enter the mouth, creating a rich, velvety texture that enhances the flavour. If you are planning to do this, make sure the egg is of the freshest and best quality. Otherwise, omit this and serve the dish with some steam rice instead which is much safer. To prepare the warishita sauce, place all the ingredients in a pan and simmer gently over a medium heat for 4-5 minutes. Remove and set aside. 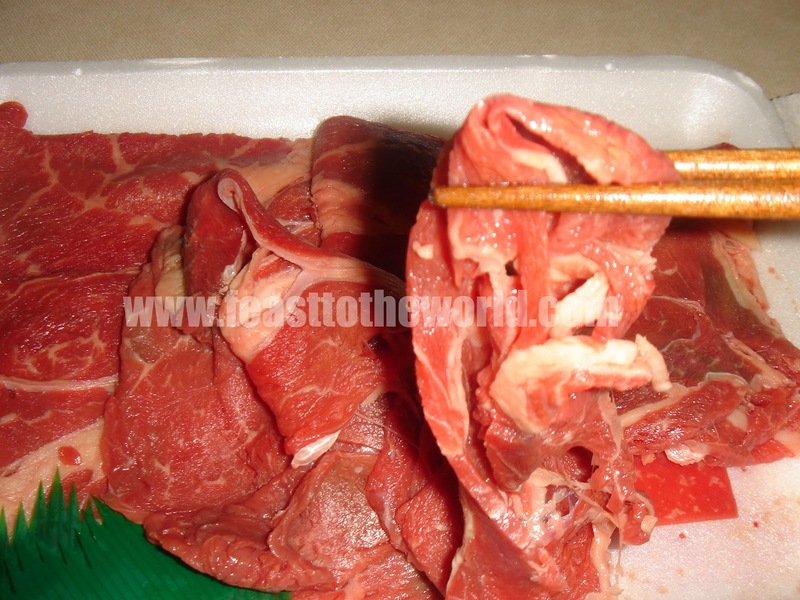 To slice the beef yourself, place the beef in the freezer for a couple of hours until it's partially frozen, then slice against the grain thinly. For the yaki-tofu, cut it into 2cm cubes. If making your own, wrap the tofu in kitchen paper and place onto a chopping board. 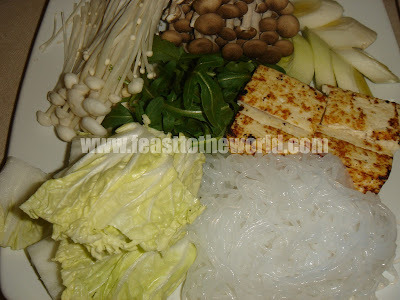 Put a weight, such as a large plate or even a book on top of the tofu to weight it down. Leave for 1 hour. This help to get rid of any excess water. Heat a non-stick frying pans over medium heat, and seared the tofu carefully on all side until golden and charred. Remove and allow to cool, then cut into 2cm cubes. Prepare the vegetables. Slice the leek diagonally into 2cm slices. For the shimeji and enoki, cut off the spongy root and separate the large bundle into smaller, manageable clusters. Wipe the mushrooms with a clean cloth to clean. Do not wash them or they will absorb too much water. If using the shingiku, wash well and pick the leaves form the tough stems. For the shirataki, wash and rinse, then cut into 3cm length. If using cellaphane/mung bean noodles, soaked in warm water for 30 minutes, then rinse and cut into 3cm length. Heat up the beef suet or oil sukiyaki pan, claypot or a medium pan over medium heat. Add the beef slices and cook for about a minute. Pour in the sauce and bring to a boil. Push the beef to one side and start adding the rest of the ingredients in neat piles. I find it easier to do this in a clockwise manner. 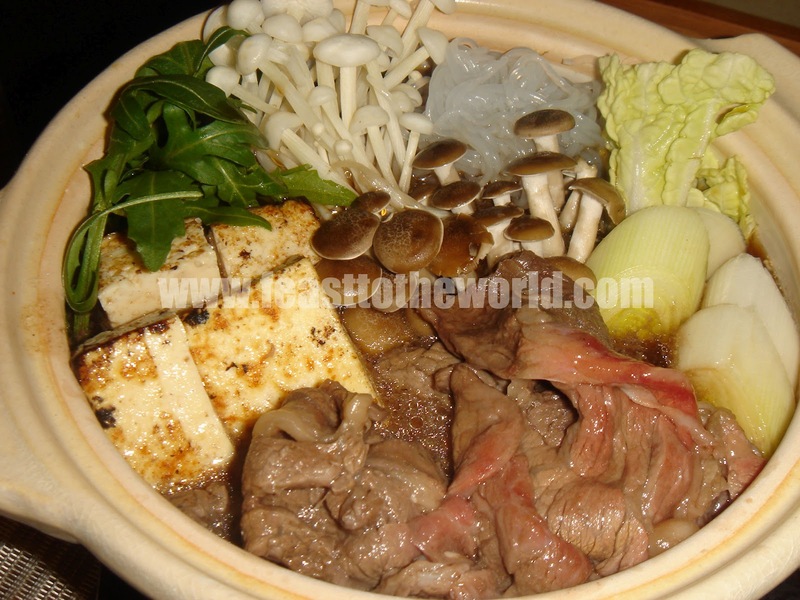 Make sure the shirataki is placed away from the beef as they will make the meat tough if place directly next to it. Simmer for another 5-6 minutes, until the vegetables are soften. Careful not to overcook the beef. To serve, each diner can help themselves to something from the pan and dip into the lightly beaten egg before eating. This can also be serve with a bowl of steamed rice instead.